These are compression ignition engines. That is, the compression stroke supplies enough heat of compression that the fuel ignites. They may use "glow plugs" to get the engine started, but do not use spark plugs. Fuel is injected into the engine at precise times in the compression cycle. Most engines run on a version of No. 2 oil that is specifically formulated for these engines and thereby derives its name as Diesel fuel. While this fuel is much safer than gasoline, the fuel and the engine exhaust has a characteristic odor that many dislike. Diesel Cycle Engines While these engines are the most efficient for vehicular use, and exhibit wonderful part load efficiency (essentially the same efficiency at almost all power levels), their use in generator service is increasingly under scrutiny by the Environmental Protection Agency in the US. True standby generators (which only operate during power outages) may be exempted, but even here, the fuel storage tanks are frequently a serious environmental concern. Many major cities are now considering rules that would forbid the operation of gensets using these engines outside of standby service. Natural gas can be used as a portion of the fuel for special Diesel engine designs called "pilot-fueled" Diesels. In these designs about 92% of the fuel energy comes from natural gas and the remaining 8% comes from the precise injection of a small amount of Diesel fuel into the compressed cylinder to ignite the mixture. Compression ignition engines cannot run on pure natural gas. 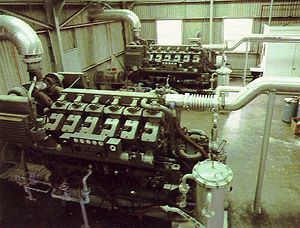 However, natural gas engines are often manufactured using a Diesel engine block. Therefore, they may look like a Diesel to the untrained eye. Where it is possible to environmentally permit these engines, they are usually the lowest cost design in the 100 kW and above range. The average installed costs are about $300-$350 per kW including the interconnecting transfer switch and controls.